Your solution for added safety and comfort with loose matting. Mat Anchor's synthetic-rubber construction ensures complete, even contact between the floor and the loose mat without damaging the floor surface. Its low profile design goes unnoticed to guests, allowing your rug to stay in place without movement. Easily maintained and breathable, Mat Anchor is 100% recyclable as well as nontoxic and non-allergenic. 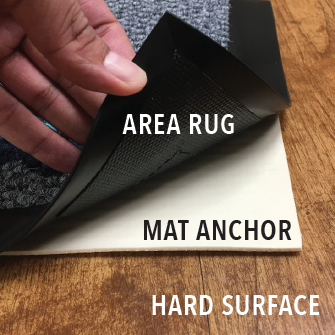 Mat Anchor works best with vG custom and logo matting used indoors in areas such as lobbies, waiting areas or customer checkout.